Administrators from Nash Community College met with leaders at the Center for Industry, Technology & Innovation (CITI) High School on Wednesday, October 31 to share information about SkillsUSA – a partnership of students, teachers, and industry working together to ensure America has a skilled workforce. Nash Community College’s SkillsUSA chapter was chartered in 2017 to help students excel by providing educational programs, leadership opportunities, events and competitions that support career and technical education. 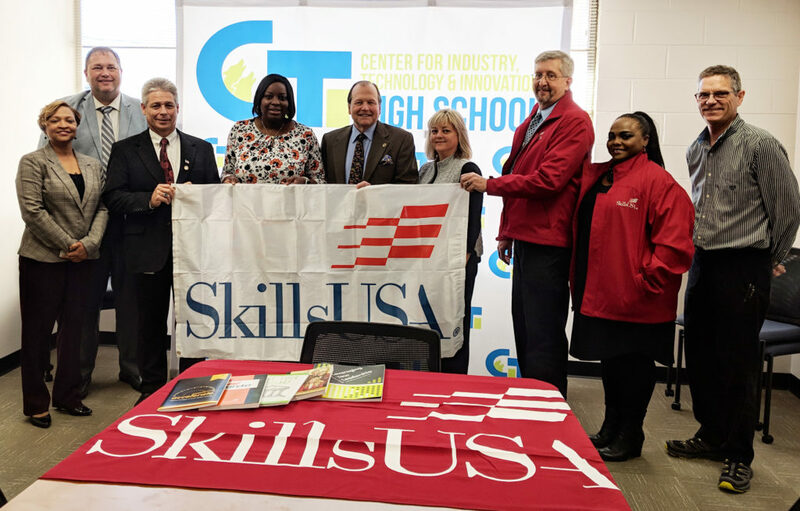 In the meeting, NCC representatives provided tools and information to help CITI High School establish their own SkillsUSA chapter to prepare students for college and real-world careers. A collaborative endeavor between Nash-Rocky Mount Public Schools and Nash Community College, CITI High School provides an academic foundation, paired with career-informed courses and work-based learning experiences, for students to prepare for college, or to enter the workforce with necessary credentials upon high school completion. “The partnership is a natural fit,” Wil van der Meulen, NCC Career Pathways and Transition Coordinator said. Just recently the college was awarded the Gold Chapter of Excellence by the North Carolina SkillsUSA office, a distinction that only one other North Carolina community college holds. SkillsUSA empowers its members to become world-class workers, leaders and responsible American citizens. The organization helps to improve the quality of the future skilled workforce through the development of framework skills that include personal, workplace and technical skills grounded in academics. Pictured above from left, Nash-Rocky Mount Public Schools Director of Career and Technical Education Pam Lewis, Nash-Rocky Mount Public Schools Executive Director of High Schools Chad Thompson, Nash-Rocky Mount Public Schools Chief Academic Officer Mark Cockrell, CITI High School Principal Kimberly Rascoe, NCC President Bill Carver, NCC Vice President, Corporate and Economic Development and Chief Economic Officer Wendy Marlowe, NCC Career Pathways and Transition Coordinator Wil van der Meulen, NCC Counselor/Career and Job Placement Coordinator and SkillsUSA Chapter Student Advisor Sonya Small and NCC Department Chair Industrial and Manufacturing Technologies Gary Blackburn.